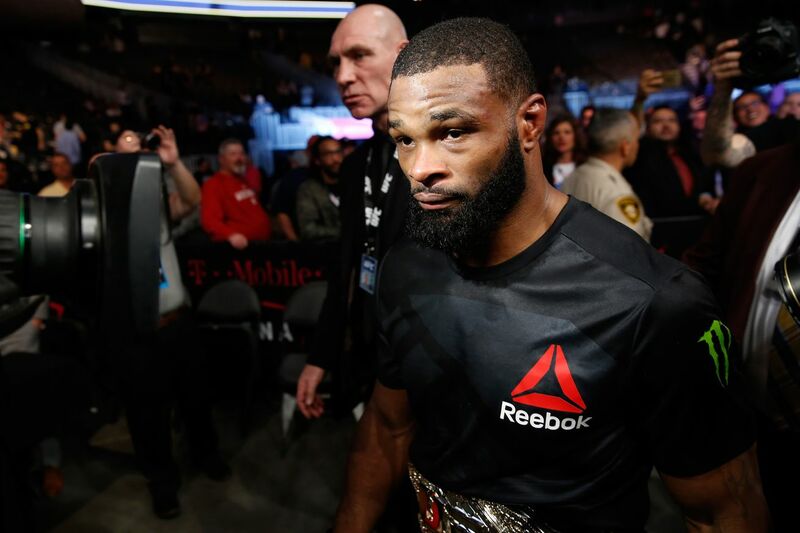 Welterweight champion Tyron Woodley looked to defend his world title for the third time tonight (Sat., July 29, 2017) against Brazilian jiu-jitsu ace Demian Maia in the pay-per-view (PPV) co-main event of UFC 214, which took place inside Honda Center in Anaheim, California. It was clear that Maia’s best chance of winning was dragging Woodley to the mat and strangling him. Unfortunately for him — and the fans — Woodley was able to stuff every single one of them and coast to yet another action-less title defense. Maia came out early back up Woodley along the cage and shot for a takedown, which “Chosen One” defended brilliantly. He wasn’t about to get discouraged, though, diving in for a second moments later, which Woodley also defended well. Maia seemingly suffered some damage to his eye, perhaps on a break, but it did not slow his roll as he went for a third takedown that once again failed to materialize. However, Woodley apparently grabbed the fence and was warned by the referee not to do it again. Woodley, two minutes into the match, finally began to take an offensive posture, but he didn’t do much but circle and hunt for a shot. Maia used the time to shoot for an outside takedown that he didn’t come close to finishing. The round ended with both fighters pumping jabs, but content to head back to their corners without throwing shots. Between rounds, it was clear that an uppercut from Woodley on a takedown attempt was basically what caused Maia’s eye injury. Maia began the round with a nice stiff jab, which Woodley countered, flooring the Brazilian with one shot. Woodley refused to follow him to the mat, waving him back up to his feet so he could continue to play his striking game. Maia attempted two takedowns, both of which Woodley was able to run his way out of. Woodley peppered Maia with jabs and then another uppercut as he once again stuffed another takedown. With him unable to get the fight on his terms, Maia began to hurl haymakers, several of which landed, but didn’t do much to rattle and/or faze the champ. Before round three started, the ringside physician checked Maia’s swollen, mangled eye and cleared him to continue. Woodley got the action started with a thundering overhand right, then a shot to the body, but Maia kept up the pressure. Woodley fired back with punches in bunches in spurts, but nothing of significance landed, compelling the fans in attendance to voice their collective displeasure in the form of boos. Maia got stuffed on yet another poor takedown as Woodley continued to conserve his offensive output. And the crowd let him hear it. The championship rounds were more of the same — stuffed takedowns, Woodley pot-shotting and fans booing. It was a terrible title fight. Woodley shows flashes of power and explosiveness, but then lengthy periods of circling, feinting and failing to engage. He did the same against Stephen Thompson, twice, and then again this evening. It’s painful to watch, especially when you know Woodley is capable of so much more. He’s just content to play it safe, try and hurt his opponent during those explosive flashes and then hope he can finish him. During the post-fight interview, Joe Rogan informed him that him and Maia accounted for the fewest strikes thrown in a title fight. Ever. For complete UFC 214: “Cormier vs. Jones 2” results, including play-by-play updates, click here.